A financial Ponzi-style fraud costs the Wilsons everything but the old family manse. Opening the Four Acorns Inn sounds like a good idea, except for one thing - someone is out to ruin them any way possible, and that includes murder. Scarlet Wilson's love life keeps tanking, no matter what she does. It's pretty sad when the elderly ladies at the inn have a better romantic life than the 40-something innkeeper. Is she cursed when it comes to men, or is there something more sinister going on? As the tension builds in this psychological thriller, the wild ride sweeps her closer to a dark, sinister secret that threatens her whole family. 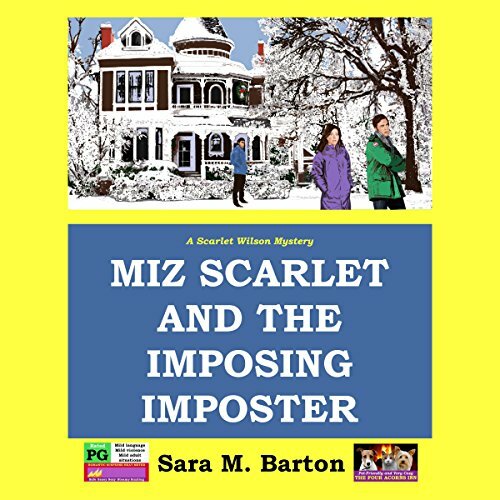 A menacing note left in the garden, an unwelcome stranger claiming possession of her cousin's home, a bloody body left on the snowy summit of White Oak Hill.... "Miz Scarlet", the feisty former teacher, finds she's up to her eyeballs in questions and no real answers. Who's in danger and why? What does it have to do with the Jordan family, who disappeared without a trace? When one of "Miz Scarlet's" dogs digs up clothing belonging to the Jordan children, her fears are only heightened. Enter Kenny Tolliver ("Captain Peacock"), the still-handsome hunk who captured "Miz Scarlet's" heart all those years ago in high school. Widowed, retired as Assistant Director of Public Safety at Princeton University, now working for Mercer Security, "Captain Peacock" has all kind of tricks up his sleeve. Good thing, because a second guest meets a gruesome death just as he arrives to take charge. Scarlet and Kenny seem to be on the fast track to rekindle their love until they run headlong into "Colonel Grey Poupon", Scarlet's annoying, twice-married brother. Even as Bur Wilson slides into 50, the old sibling rivalry reignites. As brother and sister vie for Kenny's attention, things spiral out of control.